1. Preheat oven to 325 degrees F.
2. Generously grease and flour an 8 1/2 by 4 1/2 loaf pan and set aside. 3. Place butter and the 2 2/3 cups of powdered sugar in a large bowl. Beat until creamy. 4. Beat in vanilla; then add eggs and egg yolk one at a time, beating well after each addition. 5. Mix the sifted cake flour and zest with the cornmeal, and then add to the egg mixture in three portions, beating well after each addition. Fold in blueberries, gently. Spoon batter into the prepared pan and spread evenly. 6. Bake in 325 F oven for about 1 hour and 15 minutes, or until a pick inserted in center comes out clean and cake springs back when lightly touched in center. 7. Cool cake in pan for 3 minutes, then turn out on a wire rack and sift more powdered sugar over warm cake. Cool completely and cut into thin slices to serve. Is great with fresh fruit, or some crème fraiche. View much more of our award winning cuisine by visiting our Galleries Page Here! Interested in connecting on catering? Give us a call or fill out our contact form Here. How to send me your pictures! 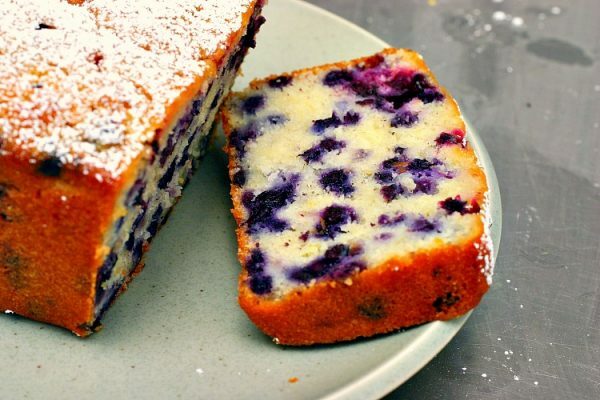 -Post it to Instagram as “Blueberry Lemon Cornmeal Pound Cake” and tag @chefjohnpaulk. 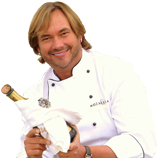 -Post a picture on Mezzaluna’s Facebook page here! with the same title as above! We LOVE to see your pictures and GOOD LUCK!